I’m actually kind of sad I have no limp, chafe marks, or any other form of marathon battle scars. In fact I feel like there is no physical proof that I even ran the marathon yesterday. Maybe I should start looking at this as a good thing? Or maybe I’m just addicted to feeling pain? The Croom Fools Run was always in the books to run, but knowing it was so soon after Gasparilla I wanted to wait and see how I felt before I officially registered. 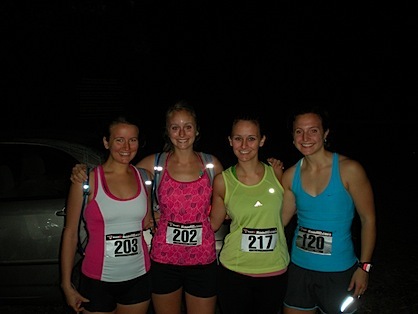 Last year I ran the 15 Mile version of the race with Caitlin, Kelly, and Abbie (who continued on to complete the 50K). You can check out last year’s recap here. Last year when we finished the 15 mile loop I’m not sure I was ready for it to come to an end. I was very tempted to continue with Abbie on a second loop and finish the 50k version of the race. Of course I wasn’t properly trained or prepared for that distance, but it was very tempting. I actually decided that day that in 2010 I would run the 50k version of the race and in April I hope to achieve that goal. Yep, that’s right. I will be running a 50k trail run on April 3rd! But, I also will not be alone!! Caitlin and Kelly have already volunteered to run the first 15 mile loop again this year and Ashley will be completing the 50k with me! This will be both mine and Ashley’s first 50k race. After the great weekend I had for Gasparilla I know that come April I will be prepared to run this race strong. Florida’s running season is quickly coming to an end, so I am considering Crooms my last run of the season. Might as well go out with a bang, right? This morning I sampled the bag of Pirate’s Booty that came in my race swag bag. This was my first time sample Pirate’s Booty and it reminded me of an airy version of puffed cheetoes. they were actually tastier than cheetoes if that is all possible, maybe it was the white cheddar flavoring that set them apart? I didn’t have time to run to Publix yesterday, so for lunch I made do with what I had in the fridge. I made a pita with the last of some hummus, tabouli, cherry tomatoes, blue cheese and spinach. A random half a sweet potato was sitting naked on the middle shelf, so I nuked it and topped it with almond butter. For dessert I had two pieces of Godiva Chocolate from a box I am still working my way through from Valentine’s Day. Godivas are meant to be slowly savored over time. The Girlfriend Getaway Orlando site is officially up and running! You can check out all of my Chevy Traverse adventures by clicking here. And if you are a Florida Resident be sure to register to win a Girlfriend Getaway of your own! Just Click Here and vote for your favorite Chevy blogger (Pick me! Pick me!) to enter.